The perils of projectisation, how we embody our activism and push for a right to rest, what it means to truly listen and meet the other person where they are, challenging masculine behaviour and discourse in aid; these were just some of the many conversations taking place at the Healing Solidarity conference last week. This was a free online conference – organised and hosted with immense focus, presence and grace by Mary Ann Clements – that brought together over 1500 aid and development practitioners and activists to discuss how our sector could be reimagined and redefined. It was deeply enriching, diverse and thought-provoking; with the speakers drawing on their knowledge as social justice organisers, facilitators, African feminists, communications experts and academics to challenge our assumptions and encourage a reflection on our identities as change-makers. I was honoured to be one of the speakers, discussing a couple of ideas from my thesis – of the racialised and gendered elements of being the ‘perfect humanitarian’ in the popular imagination; and the problems this raises, and reinforces, with regard to mental health and wellbeing and the distinctions between male and female, and national and international, aid workers. What I would like to present here are some of the themes that emerged from the conference. There is no way I can do this justice, or give due attention to all those who contributed to the conference, since I was offline for half of it and unable to listen to all 22 speakers. Although I intend to get through them all at some point, I feel drawn to writing some reflections now on the discussions I participated in. Perhaps this will also encourage those of you who were unable to participate to go to the Healing Solidarity website, where you can download the talks by making a modest financial contribution – I believe it is well worth it! For ease of accessibility, and as a way to collect my thoughts, the themes are divided into headers below. The problems of projectisition in development. This came up a lot, for instance in talks given by Jennifer Lentfer, Nomvula Dlamini and Kate Werning. Our tendency to set unrealistic goals and timeframes in our work is part of an aid paradigm focused on control and getting things done, which pays little attention to the small, incremental and meaningful changes being made in local contexts. The issues that affect people day-to-day, including gender inequality, have become projectised; yet building just societies cannot be based on projects alone. There is not enough time given to pausing and recognising each other’s efforts, resulting in, as Nomvula Dlamini put it, ‘busyness’ at the expense of the relationships that connect us. We were encouraged in Kate Werning’s discussions to ask ourselves, “What would you do differently if you knew your work was going to take 10 years or 100 years?” The point being, that it is worthwhile figuring out where we can slow down in our work, act more from the heart and look after each other and ourselves in the process. Shifting the lens of power and expertise. There were so many discussions around this theme, with participants considering questions such as: How can those with power in the northern hemisphere use their voices differently? Can we change the language of aid so that terms such as ‘expertise’ or ‘global north/global south’ are either done away with altogether or reclaimed and redefined by communities in the south whose embodied knowledge is too regularly overlooked or silenced? How can we include alternative perspectives in development decision-making that has hitherto largely been the domain of white men and women? Some suggestions made in response to these problems included Deborah Doane’s advice to look at our governance models – the influence of government donors, the extent to which board members are representative of people we’re working on behalf of – and to avoid taking up country director posts in field locations in the south. Angela Bruce-Raeburn echoed this by encouraging white aid workers to observe who is at the leadership table; who are we not paying attention to and what are we not hearing? She also pushed for more solid and consistent relationship building between headquarters and local offices, where knowledge that is generated should start from the local level and where there are feedback loops to ensure the information collected from there is correct. This is particularly important now as aid agencies consider the response to sexual harassment and abuse claims in the sector and how to implement safeguarding measures. Marion Osieyo believed that we need to be asking more questions, to push back on assumptions that we know better than local people in the contexts in which we work, and to develop partnerships which encourage collective thinking and decision-making. Getting comfortable with being wrong and not knowing. This too was about power and agency, and was discussed by Angela Bruce-Raeburn, Lisa VeneKlasen, Jennifer Lentfer and Marion Osieyo among others. As aid practitioners we must acknowledge our complicity both in the colonial structures and systems of oppression that foreshadowed the aid paradigm, and in the sector’s continuing inequalities and power imbalances. Angela Bruce-Raeburn argued that humility was essential; after hundreds of years of devastation and oppression in countries receiving aid, we cannot expect to fix things on a one-week mission, and we must understand that for many people living in these countries this is a lifetime of struggle. Jennifer Lentfer believed that as white aid workers we must learn to shut up and not think our idea is the idea in our organisations; we have to listen to others and be willing to feel uncomfortable with what we hear. Marion Osieyo suggested that curiosity is very important; we should never assume we understand a situation as these assumptions may have negative implications for the people with whom we are working. Care for self, care for the other. What I feel was so important about this conference was that it linked these big, thorny issues of power, agency and resourcing within the sector with our individual stories; what motivates us, what brings us hope, and what exhausts and silences us. Too often we view issues of oppression or violence as ‘out there’; issues that do not directly affect us but are relevant to the communities with whom we work. Jessica Horn’s discussion reminded us that our own embodied histories are important; when we open up the space to acknowledge our own suffering then we may generate greater solidarity with others. This has been particularly relevant for the African feminist movement, whose members have been affected by violence and oppressive systems of power. But many of the speakers highlighted that our personal stories say a lot about both our privilege and our vulnerabilities, and we should be reflecting on this more in order to create a culture shift in the workplace; from one that is highly macho and dominated by ‘cowboys’ to one that values rest, reflection and compassion. For Marion Osieyo, this entails merging the inner and outer life; developing practices in our lives that connect our sense of self with the world around us, and which help us turn towards ourselves in order to turn more fully to our work. When we push this kind of reflection away, we risk acting from a place that is far from the heart, and which may do more harm than good to ourselves and others. Kate Werning suggested we consider questions such as ‘Why are we here? What draws us to the work? What’s in it for us?’ in order to encourage an organisational culture that shows that wellbeing is central to our success. And Lisa VeneKlasen provided fresh insights into power and how our own shame, insecurities and imperfections can help empower us, connect with others and build more positive, equal models of development. The message from these speakers was very pure and clear: we must bring more joy and love into the aid and development sector if we are to challenge and transform it. There were some wonderful grounding techniques led by Agnes Otzelberger and Mary Ann Clements among others (sorry I couldn’t get to them all!) that helped put this principle into practice, and which we can use in our day-to-day lives to help us connect with ourselves and others. All in all, there was so much to take away from this conference; to work with in ourselves, and in our communities and organisations. As Mary Ann Clements pointed out in her closing remarks at the end of the conference, space has opened up for us to challenge situations of patriarchy and racism in our sector. In this regard, I believe healing solidarity means three things: recognising our own positioning within these situations, recognising where other people are at with regard to understanding the problems, and being willing to meet them and ourselves on this trajectory with compassion and the belief that we all have a role to play in creating more positive models of development and power. This entry was posted in Reflections and tagged aidworker motivations, emotions, expat aidworkers, female aidworkers, self-care, stress on 25th September 2018 by AidSoulSearch. Today I am providing a quick update on my work on stress in the aid sector, and news of an exciting, inspiring and innovative conference coming up next week, which everyone can join and participate in! These last few weeks I’ve reached that point that many doctoral researchers will be familiar with; where the Phd truly takes over and ‘normal life’ grinds to a halt. The good news is that I’m in the finishing stages, and I’m really looking forward to sharing my findings with aid practitioners and people who are interested in engaging further in debates concerning stress and wellbeing in the aid sector. In the weeks and months ahead I will be publishing some key reflections and findings emerging from my thesis on my blog site. I will be looking at far more than simply the common stressors in the sector, such as the challenges of living in remote or dangerous environments, and considering how aid structures, systems and policies contribute to particular expectations around how staff should behave. The thesis includes a host of personalities from my research in Kenya, who are not simply ‘aid workers’ but human beings with a diversity of experiences, hopes, desires, fears and insecurities. My interest is in highlighting how there are particular assumptions made about what constitutes ‘good’ aid work (heroism and altruism are terms I investigate and deconstruct), and these often leave out the personal lives and vulnerabilities of staff, in racialised and gendered ways. There will be a focus on the inequalities that exist between national and international staff, but also the specific challenges facing, for instance, national women aid workers or African expatriates working in Kenya. 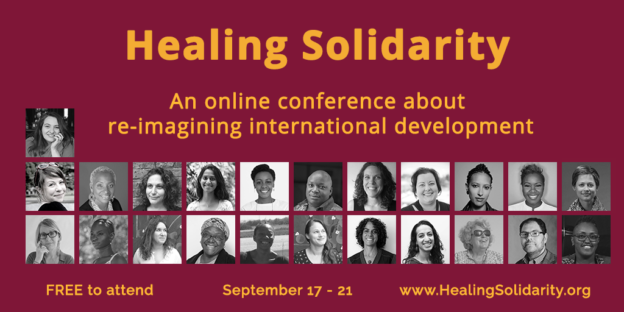 For those who want to learn more right now, before I start publishing some thesis extracts, you have a wonderful opportunity through the Healing Solidarity conference, organised by development practitioner, facilitator and coach Mary Ann Clements. This is a free, online conference running throughout next week, 17-21 September, and featuring a host of speakers from the development sector. We cannot talk about stress and wellbeing in the aid sector without acknowledging the role of aid organisations, systems and structures in shaping the way staff behave and restricting the spaces and opportunities for discussion around personal problems and vulnerabilities. Please do join us for the conference! Sign up and join the Facebook page to get all the details. Each day from 17-21 September there will be 3-4 discussions with different speakers, which you will be able to comment on via the Facebook page, and there will also be daily live reflective practices that you can join. The full details of the schedule can be found here. This is going to be a great opportunity to interact with development practitioners, experts and activists who are trying to reformulate the way we envisage and deliver aid in ways that foster a more inclusive and equitable workplace and environment. I’m so excited to be part of this conference and look forward to listening to all the incredible speakers! This entry was posted in Reflections and tagged burnout, emotions, expat aidworkers, female aidworkers, national aidworkers, self-care, staff welfare, stress on 12th September 2018 by AidSoulSearch. @arbiebaguios My PhD thesis will be published via the University of Sussex and an article published in Gender and Development journal in June, both of which tackle this issue. @pontso_mafethe Yes...and national/international...many problematic disparities in the sector that go beyond gender. #AidToo – What Now and What Next?